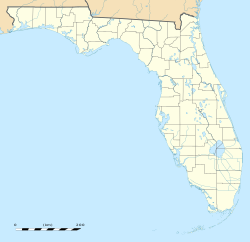 Leesburg International Airport (IATA: LEE, ICAO: KLEE, FAA LID: LEE), formerly known as Leesburg Regional Airport, is a public airport located three miles (5 km) northeast of the central business district of Leesburg, a city in Lake County, Florida, United States. It is owned by the City of Leesburg. Leesburg International Airport covers an area of 818 acres (331 ha) which contains two asphalt paved runways: 3/21 measuring 4,957 x 100 ft (1,511 x 30 m) and 13/31 measuring 6,300 x 100 ft (1,920 x 30 m). The airport has been designated as a "User Fee" airport by the U.S. Customs and Border Protection, Department of Homeland Security. Offering U.S. Customs and Border Protection service, Leesburg International Airport can serve as the first port of entry for aircraft returning to the continental United States from a foreign country. Leesburg International Airport has an Airport Rescue Fire Fighting (ARFF) Station that is staffed 7 days per week, 24 hours per day (24/7) with professionally trained and equipped firefighting personnel. The Air Traffic Control Tower is open 7 days a week from 7:00 a.m. to 7:00 p.m. (0700 to 1900 local) with the Frequency being 119.35 and Ground Control being 121.725. For the 12-month period ending May 18, 1999, the airport had 114,061 aircraft operations, an average of 312 per day: 99.8% general aviation and 0.2% military. There are 186 aircraft based at this airport: 67% single-engine, 23% multi-engine, 5% ultralight, 3% jet and 3% helicopter. For the World War II use of this facility, see Leesburg Army Airfield. 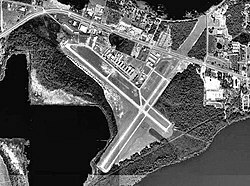 The airport was constructed in 1942 and was commissioned in January 1943 as Leesburg Army Airfield (AAF). It was used as a United States Army Air Forces training airfield by the Army Air Force School of Applied Tactics at Orlando Army Air Base. The airfield was closed after the end of World War II and turned over to the City of Leesburg. A veteran of the United States Navy with master's degrees in Aeronautical Science and Business Administration in Aviation from Embry-Riddle Aeronautical University. ^ Airport information for Leesburg International Airport (ICAO: KLEE, IATA: LEE, FAA: LEE) at Great Circle Mapper. This page was last edited on 1 October 2018, at 22:52 (UTC).